West Bengal: In a highly unfortunate incident reported from Bankura, two medical practitioners met with a fatal accident after their car collided with a sand dumper at the town bypass. While one medical practitioner lost his life after the accident, the other is still fighting for it. Both the doctors are attached to Bankura Sammilani Medical College and Hospital (BSMCH). The deceased has been identified as one Dr Abhijit Dey (54) who was the RMO at the Radiotherapy Department. The other doctor- Dr Amitabha Roy (62) is the department head at the medical college hospital. His condition remains critical. On Wednesday morning, the duo, who live in Kolkata, left for the hospital taking a train together till Durgapur. From there, they hired a car to reach Bankura. 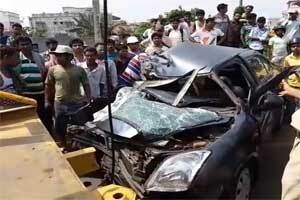 Around 9 AM, as the car was passing through the Bankura town bypass, it collided with a dumper coming from Junbedia Panchbhanga. Police, with the help of locals, rushed the two doctors to BSMCH. Unfortunately, Dr Dey was declared brought dead while Dr Roy was admitted with major head and chest injuries. The doctor was later shifted to SSKM Hospital . The unfortunate incident has brought forward the inability of the medical college hospital in providing sufficient space for the employees to live. The colleagues of the doctors informed that both the doctors used to travel long distances regularly from the city as the hospital campus did not have enough accommodation for doctors coming from Kolkata or other cities. “Most doctors from Kolkata have to travel over 200km daily to Bankura for work. At times there is a workload, we have to put up in lodges around the hospital. It is high time the government arrangements for doctors’ accommodation,” a concerned colleague told TOI. It is unfortunate daily traveling so much km\’s and working is it necessary collage should provide accommodation as per mail.